Obituary – Kirchner, Kenneth Kenton « Perry High School Alumni Association, Inc.
Pres. Nulli Secundi Society; Treasurer Websterian Club; Football 12-16; Baseball 13-14; Class Track 14-15; Glee Club 12-13. Perry Memorial hospital following an illness. Funeral will be at 3 p.m. Friday at the Parker chapel with Rev. Jon Neuhs, pastor of the First Presbyterian church, officiating. Burial will be in Grace Hill cemetery under direction of the Parker Funeral home. The family has invited contributions to the cancer fund. Parker Funeral home will be custodian. He was born March 5, 1895, in Nebraska and came to Noble county in 1903. He was a graduate of Perry high school. Kirchner was married in 1925 to Thelma Pouder, who preceded him in death in 1955. 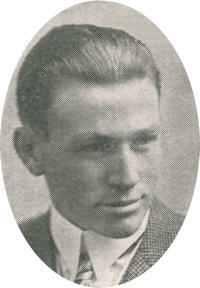 A veteran of Army service in World War I, Kirchner had been active in farming and oil leasing. He was a member of the National Arabian Horseman’s association and was a member of the Aberdeen Angus association. Over a period of many years, Kirchner established a reputation of being one of the best supporters of the Perry high school wrestling team. He also was an avid fan of the sport of wrestling at the collegiate level. Survivors include one son, King P. Kirchner, Tulsa; one brother, Ralph Kirchner, Bristow; two grandsons, Kenton Kirchner, Tulsa, and Kyle Kirchner, Dallas; and one step granddaughter, Stephanie Kirchner, Tulsa.